It has been a long time since I last made this. 1. Steam banana for 5 mins. Leave it to cool and slice into pieces. 2. Cooked banana leaves in boiling water until soft and cut into desired size for wrapping. 3. Mix coconut milk, hoon kueh powder, rice flour, tapioca flour together. 4. Mix water, sugar, salt together and boil until sugar dissolves. 5. When water boil pour in flour mixture and cook mixture until it boils and thickens. 6. Spoon 1 tbsp of hoon kuey on the leave, top it off with 2 to 3 slices of banana. Top off with another 2 tbsp of hoon kuey. Wrap up hoon kuey. 7. Leave it until cool then refrigerate well before serving. 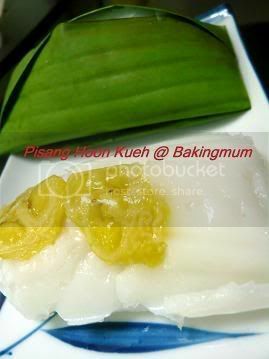 hi aunty lee lee...the kueh looks delicious n would love to make some for friends n family.Can you kindly share the recipe. Ok let me type it out and post it here. Love reading your blog, will try to bake one of your cake recipes one of these days. I made this kuih long time ago and the texture did not turn out right so I have given up...glad that you have posted this and will look out for the recipe that you are going to post. you are really a great cook! how envious of your family...can you share your steamed tapioca recipe? Sure, I will have it typed out and post it here. Thank you for receipe , but what is "100 gm hoon kueh powder" ? Is it a flour ? ..and where I can buy that powder ?? thanks again . thanks for the recipe...really appreciate it. May i asked how long can this kueh stays in its original taste after steaming...can it be kept overnight. Will the banana flesh change colour after kept for few hours or overnight. Hi Anonymous, hoon kueh powder is actually green bean flour. Sue, the banana after steaming will not turn black easily. Furthermore the banana will be wrapped under the banana leaves so it can be kept in the fridge for quite a few days. instead of using banana leaf to wrap, what else can i use to wrap? xan, if no banana leaves no worries, just use aluminium foil to wrap. hi aunty lee, tried making this kueh today but encounter a few probs. The bananas turn black after steaming , do u steam with the skin or off? Because i peel of the skin then steam. How to see if the batter is cooked. How high should the fire be and agaration how long should it be cooked. I cooked mine in medium fire n after less than 2min it already thicken , is that how it should be. Hi hugbear, thanks for your receipe. Tried your receipe but it mixture didn't thicken and so when I poured into tray to cool down, it didn't harden as well. Would it due to too much water? How long did you stir before it thicken? Sorry, I cannot really remember how long I cook before it was thicken.